And here she is, lying next to me on the loveseat. Hard to believe an animal so adorable and sweet could clear a room with one passing of gas. Bonnie, my darling! That's a great photo, by the way. Love it!! Wrong. There's no such thing as "Scottie-proofing" a house. I love to eat (no secret) but She was surprised to find that I tried to eat a cookbook ($40 to the library where it was checked out). Don't try to outsmart us-you'll fail on Scottie-proofing. You're right on mark, Scottie Mom! Bravo, Scottie Mom! From a mom who's been owned by Scotties the past forty years (and one, currently), you have learned well! I love Scotties exactly for those independent strong personalities that some people find difficult. Scotties seem to have their own program in mind. I loved mine dearly but I did not find them slavishly dependent on me. Your text is fantastic , sometimes reading your posts it´s clear that you have the right feelings at the right time . Please join us at our group at Facebook , Scottish Terrier . Most of us are brazilians but be sure that we have a strong bond , the love for our scotties . I have had three. My first I got at 6 wks right after he was weaned. Had him until he was 12 yrs 6 months. Had to put him down from bladder cancer. The worse day of my life. Actually the cat was the one out of joint. the two of them became very best friends. I have had Scotties for 22 years. My last two have been rescues. Would never have any other kind. They are awesome dogs once they teach you how to handle them. My second one I had six years he had an enlarged heart and I had a very stupid vet who wouldn’t listen to me and he died of heart failure. His last year he went out killing 16 moles and two baby rabbits. He was quit the hunter and really enjoyed his life with me. He learned to become friends with the cat. The cat really mourned him when he died My current one came from a very bad puppy mill. I got her at the age of two. she is now 8. My buddy but is still very damaged psychological. She is afraid of everything and still will not get off the couch after six years and explore the house. I am retired so we spend our days next to each other. We are like glue. She is starting to hand play. It makes me sad that she didn’t have a puppy hood. She is still a wonderful Scotty and buddy. Wouldn’t give her up for all the money in the world. Great at showing a sad face and making you feel guilty if you go out and for any reason they can't come. Permanently hungry. Thinks we share his house. Eats and sleeps. Sleeps and eats. We love him. I would add that they are not for kids. I love my Bonni, but we gave up having kids over. You can't trust the kids to follow rules and when they tease or won't give the dog space... They might get nipped. Even though it is usually the kid's fault, it's not worth the risk. Such accurate description of the Scottish Terrier! I had two Scotties in my life. Charlie, my first, was my little angel. 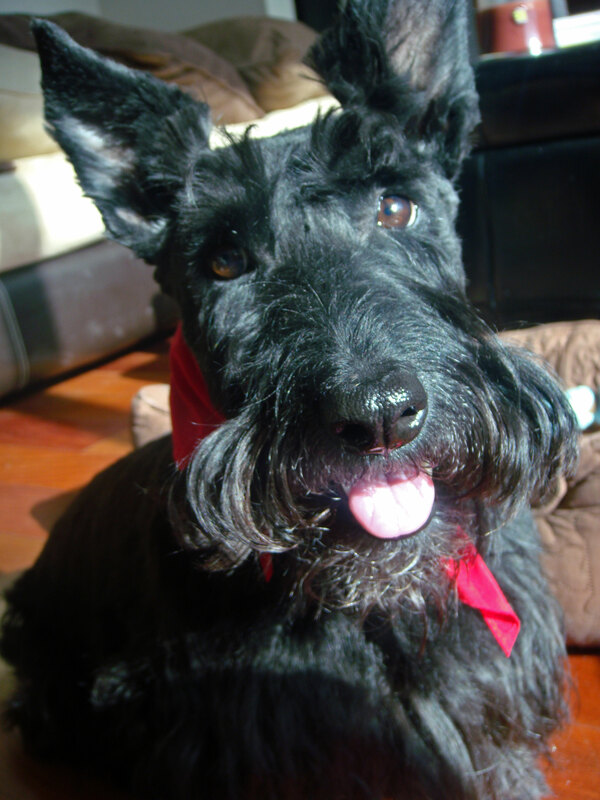 He was such a good boy, but ,in true Scottie nature, he was strong willed as can be. He was with us for nine years, four months and thirteen days. In two weeks it will be two years that we had to say goodbye and I still miss him so much. Thankfully we have Daisy, Charlie's niece that we got a year after we had him. She, like the rest of the family struggled after we lost Charlie, but from that day she was never alone. I take her to work with me everyday and at my job she had become somewhat of a mascot. She has a fan club, some customers come in just to see her! She has such a great personality, friendly with everyone. Scotties are truly great companions, I feel lucky to have experienced their love and to have had and to still age the chance to love them back.